Not sure if you or a colleague registered? Check out the Industry Partner Registered Attendee list! If you're not on the list, we're not expecting you! Please email laubrey@nnecos.org ASAP to remedy the situation! 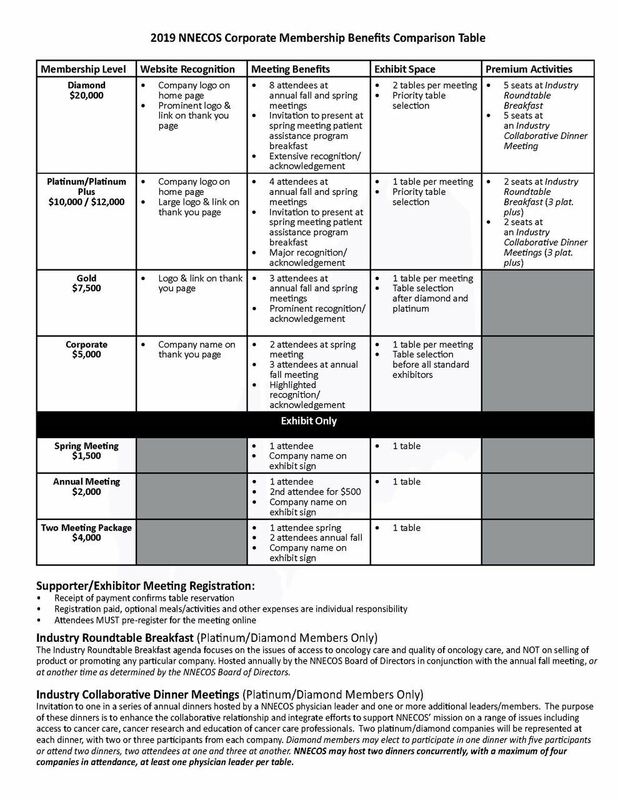 All industry participants must complete the Industry Partner Code of Conduct at NNECOS Events Agreement prior to attending. If you plan to exhibit, set-up will be available beginning at 6:45 am. Please note your table assignment on the diagram above. IMPORTANT: Each representative from your company who is attending needs to register separately so that we have a name badge for everyone and the correct counts for seating, breaks and meals. Your assistance in ensuring this happens is GREATLY appreciated! Registration Check-In for attendees opens at 7:15 am. Attendees at the spring meeting are primarily non-physician oncology professionals. The Patient Assistance Breakfast presentations begin at 7:30am. Participating companies will receive a separate email about the logistics of this session. 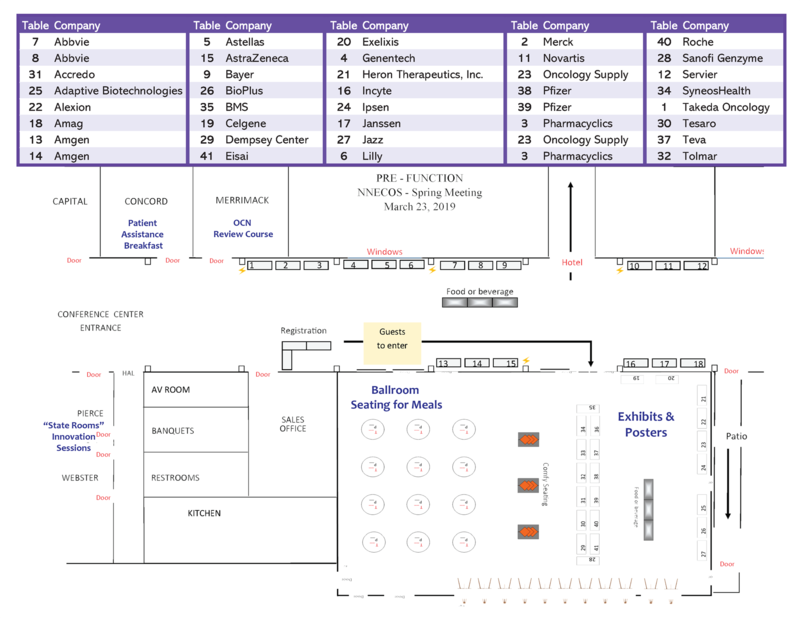 All exhibitors are invited to share information about their patient assistance/patient access programs at their exhibit table. Due to time limitations, presentations slots are available only to diamond and platinum level supporters. Once again, the presentations will be held in the educational meeting space and open only to non-industry participants (with the exception of the company presenting). This allows presenters to be in compliance with their company internal guidelines and regulations and allows the participants whose patients may take advantage of these programs to be fully engaged in the presentations. All attendees not participating in the breakfast will be invited to enjoy breakfast in the exhibit area and network with colleagues not participating in the breakfast presentations. OCN Review participants go into session at 8:00am.